Choice of Solid White Hat, other colors available! 21-22 inches head with approx. 5 / 6 inch drop. Or Natural Hat with White Brim! Personalized with your 3 letter monogram or "Bride"! 1. Hat Monogrammed with either Bride or 3 letter monogram. 2. All Include grosgrain band and bow. 3. May add flower.. or not. Please ask questions concerning pricing before ordering if you are unsure! I am also offering this hat with other trim colors! Send convo! Ribbons, Bows or Flowers ! Flowers shown are samples of previous customer hats only. Please send convo for your color choices! Ribbon colors in stock are black, navy, white or hot pink, and more! I have other colors, but some may be a special order, therefore, please send a convo with your preferences. 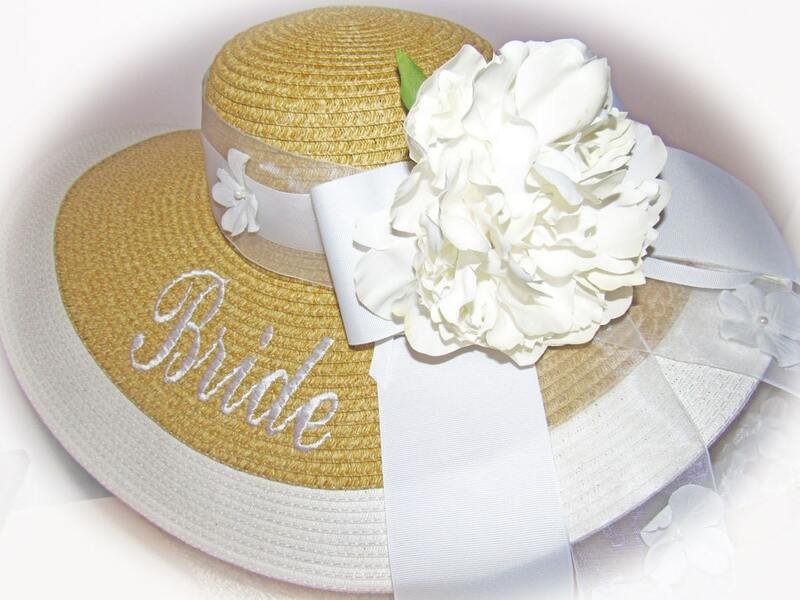 This hat may include a 3 letter monogram, a large handmade flower, a handmade bow and a flat or ruffled hat band! BRIDE may be chosen for the monogram. Flowers are handmade from recycled silk flower petals, therefore, each is one of a kind and seasonal. Rhinestone centers may be added for a little bling :). Only on the flowered hats. Large bows and/or flowers can be worn on front, side or back. This sale is for the solid white hat or natural hat with stripe but I also have other hat colors! Please & check my etsy shop for details. Each monogram is custom designed with coordinating hat band, bow or flower. Hats are shipped within one week unless shop is on vacation!